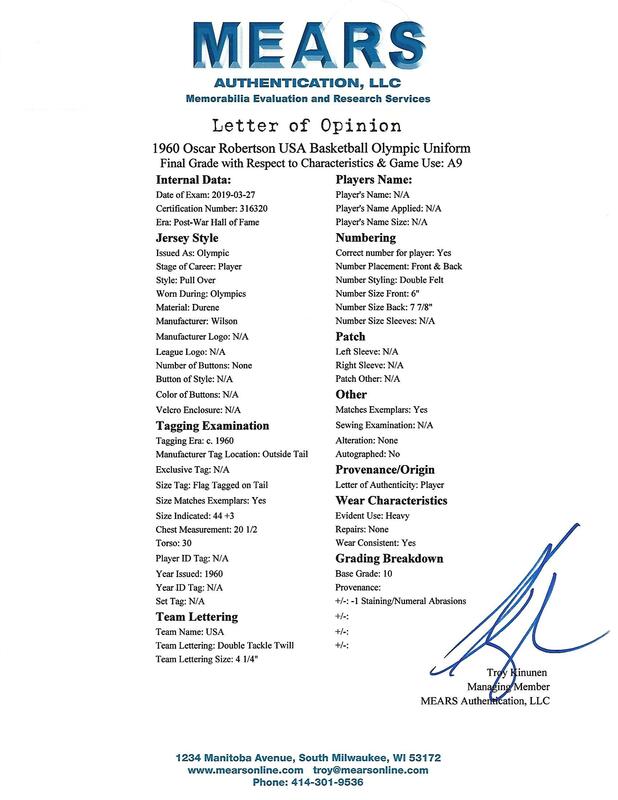 The world of Olympic basketball was irrevocably changed in 1992 when the “Dream Team” broke the age-old amateur rule and fielded an unstoppable aggregation of NBA stars. But before that Dream Team, there was an earlier squad of American players who captured the Gold while upholding the Olympic amateur ideal. 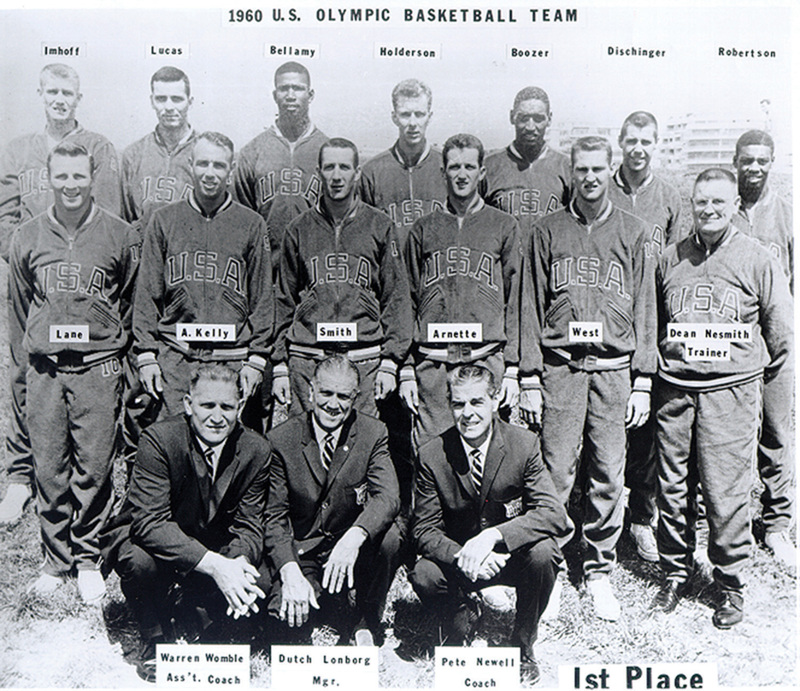 Competing at the 1960 Summer Games in Rome, Team USA featured America’s finest collegiate stars including four future Hall of Famers: Walt Bellamy, Jerry West, Jerry Lucas and Oscar Robertson. Coached by Cal-Berkley’s Pete Newell, the American team won every game of the competition by an average of 42 points to win the Gold. The squad’s collective talent was such that the entire team has been enshrined in the Naismith Basketball Hall of Fame, and is regarded as the greatest amateur basketball team ever assembled. The undisputed star was 21-year-old Oscar Robertson, who had just finished off perhaps the most dominant college career ever at the University of Cincinnati. 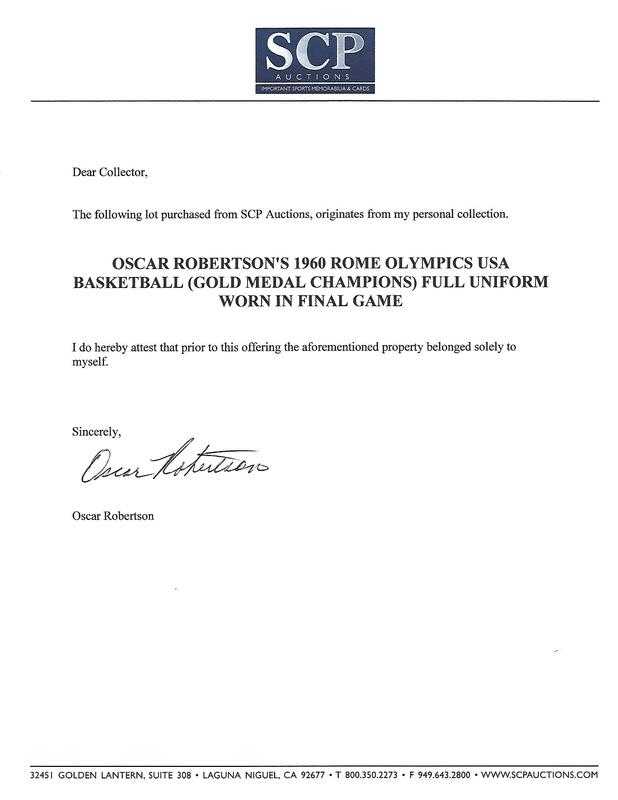 This special offering is in fact the full uniform worn by Oscar in USA’s Gold Medal Final victory over Brazil by the score of 90-63. 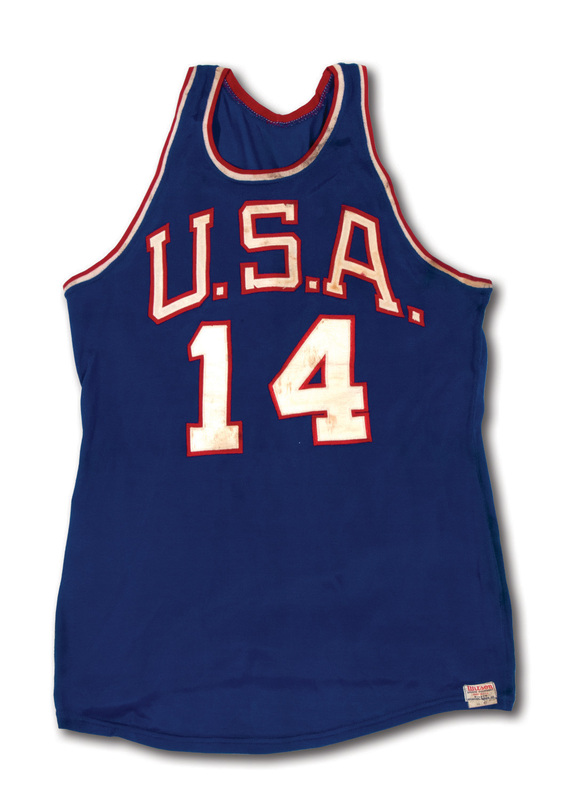 Two of Oscar’s other game jerseys (one white and one blue) from the 1960 Olympic tournament have been sold previously, but he made sure to keep his complete blue uni from the Finals, proudly displaying it framed on the wall of his Cincinnati home for decades thereafter. 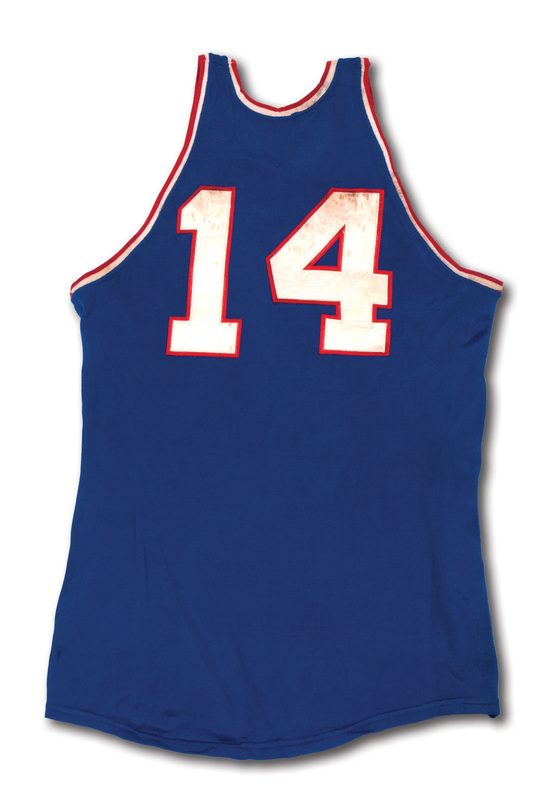 The blue durene jersey, with red and white trim along the neck and arms, boasts Robertson’s number “14” below “U.S.A.” in white-on-red tackle twill across the front. A slighlty larger number is repeated on the back in the same color scheme. The lower left front tail has the Wilson label with a “44 +3” flag tag affixed. There is some noticeable red/brown toning on the front 'S' and 'A' letters from a comination of perspiration and age; it is more spotty on the front and back '4' and along the red and blue piping of the back shoulder strap. 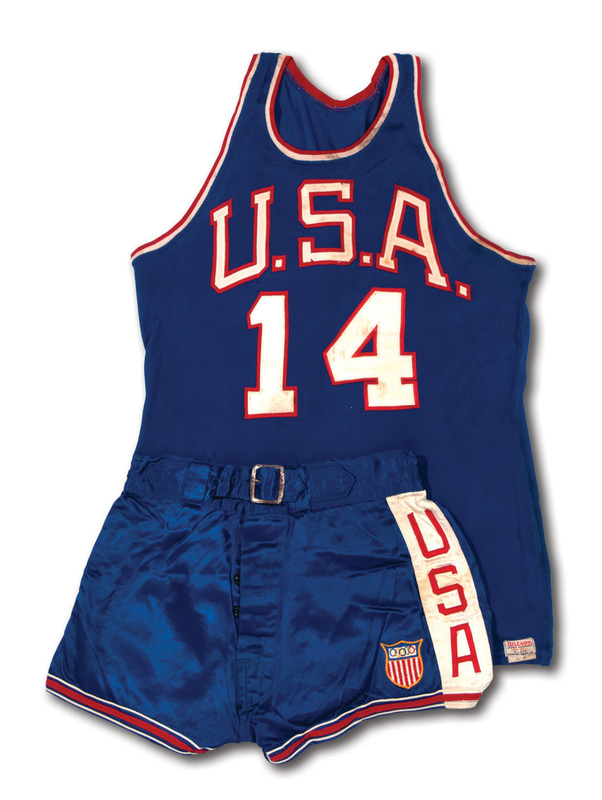 The blue satin trunks, with red and white trim along the legs, have “USA” in red against a thick white stripe on the left side next to the ever-important USA Olympic team shield emblem patch. 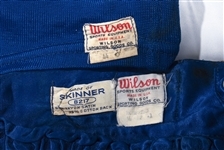 The shorts are properly tagged on the interior by Wilson, with a flag tag reading "ROBERTSON" and size "34 1/2 +1" and an adjacent "Made of Skinner 8217" materials tag indicating 64% satin and 34% cotton. They come equipped with a still perfectly functioning elastic waistband and belt buckle. 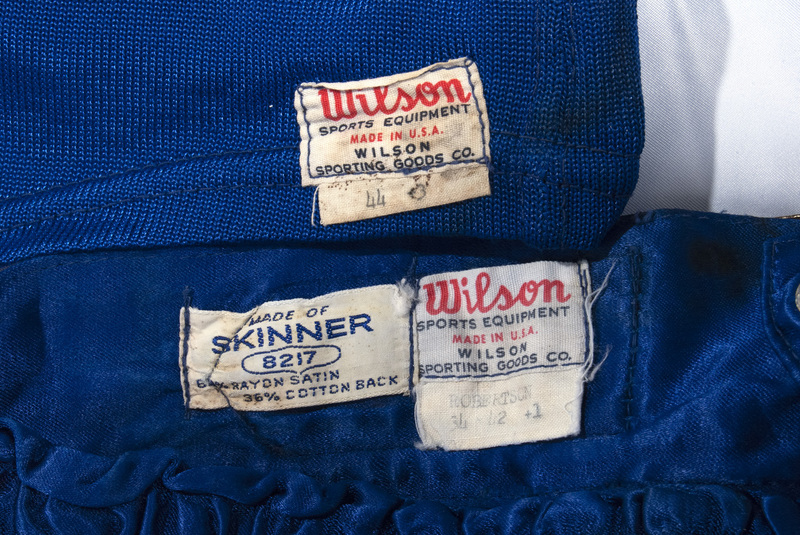 Both articles exhibit obvious signs of wear from the iconic 1960 Olympic Finals. 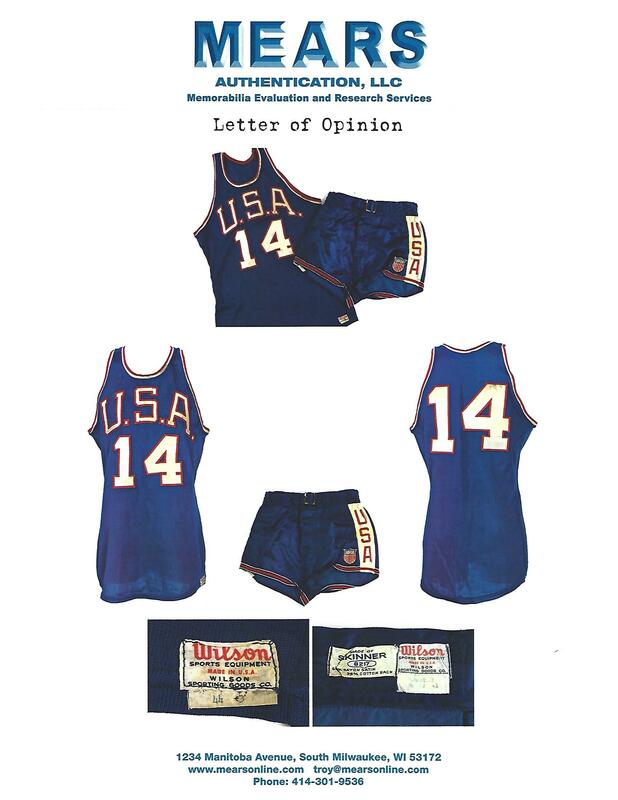 It should be noted that in 2012 we auctioned Oscar’s white 1960 Olympic jersey for $121,324; and just last year we sold the blue jersey he wore in the 1960 Olympic semifinals for $90,983. For this uniform, however, there is no equal. Includes LOA from Oscar Robertson. LOA from MEARS graded A9 (one point deducted due to the aforementioned toning).